The Macallan and Grants (Dufftown) Ltd production sites are located in the Highlands. One of Scotland’s trademarks is undoubtable Scottish Whisky. With about 126 distilleries throughout Scotland the manufacturing of this product is an important factor for the Scottish economy. Therefore Scotland hosts some of the most famous Whisky producers in the world like, The Macallan. Whisky production doesn’t only offer a market for the actual manufacturers but also for instrument suppliers which are specialised in manufacturing instruments, like Grants (Dufftown) Ltd. The Macallan production site in Craigellachie. In June 2017 The Macallan opened their new distillery and visitor centre in Craigellachie. They have built an impressive new production site cut into the slope of the land. Thanks to the shape of the building with its grass roof it nearly seems that there is no building at all - just nature. When entering the distillery you are faced with a massive wall with a selection of Macallan’s products and you quickly realise, that this manufacturer with it’s wide range of products cannot be overlooked. Throughout the factory you can notice that their aim was to enlarge there production site in order to meet the increasing demand of whisky. Therefore they installed an 17 tonne mash vessel, 21 fermenters and 36 copper pot stills. In order to measure the level of the liquids inside those tanks Macallan applies a range of VEGAPULS non-contact radars and VEGASWING Level Switch devices. In addition to the new production site, Macallan also built a visitor centre. This centre offers a tour which contains interesting information about the history of Macallan and about the whole production process - starting with the building of the barrels, the actual Whisky distillation to the Whisky’s fermentation process. After this tour you even have the opportunity to taste a range of the Macallan Whiskies or to buy a bottle of Macallan Whisky in the customer shop to take home. The Macallan production site: distillery vessels from below. Grants (Dufftown) Limited is located in Rothes and is therefore only four miles from The Macallan Distillery. They produce vessels and supply distillation equipment. This instrumentation includes a variety of VEGA devices. Their services include electrical contracting and installations, as well as instrumentation pipework. As they are nearly the only company in Great Britain which sell copper distillery vessels and being located within direct reach of The Macallan distillery, they produced all 36 copper tanks for Macallan’s new production site. These vessels are still manufactured into shaped pot stills using the traditional hand hammering techniques. This procedure takes approximately 20 hours and as there is a high demand, the waiting time for these products can take up to three years. Hybrid vessel manufacturing at Grants (Dufftown) Ltd.
VEGA devices on a mash vessel at the Macallan production site. Both companies make use of our pressure sensors VEGABAR 80 series, non-contact radars VEGAPULS 60 series, level switches VEGASWING 61-63, as well as the capacitive probes VEGACAP 62 and Guided Wave Radars VEGAFLEX 81. Due to their high number of customers in the whisky industry - which amounts up to 60 in Scotland alone – and their long term relationships in the power, petrochemical and domestic industries, VEGA had the opportunity to gain a lot of experience in these areas. Therefore they are able to offer the suitable measuring solution for every application in these industrial sectors. To sum up my visit, it can be said that The Macallan production site is definitely worth visiting. The distillery architecture is unique in its appearance as well as in its size. It offers its customers a presentation of the production process of Whisky in a vivid way. Furthermore you can see the distinctive copper vessels at the Macallan premises and realise how challenging it must be to get every vessel in the exact same shape as each other, a real testament to the skilled coppersmiths at Grants (Dufftown) Ltd.
Alcohol storage tanks are considered potentially explosive and are therefore kept in special rooms. 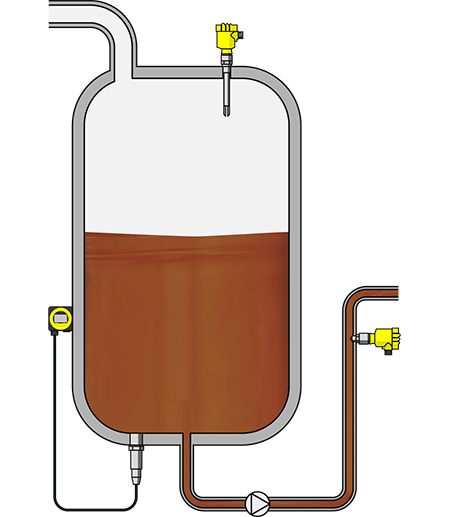 When the alcohol is needed, it is pumped directly to the appropriate production vessel through a ”ring main” supply system. Reliable measuring instruments are required for dependable measurement of the level in the tank and for monitoring the feed pressure in the pipeline.